Air Nelson Limited is a domestic airline based in Nelson, New Zealand. As a fully owned subsidiary of Air New Zealand, the company is responsible for providing air transportation services around the country under the Air New Zealand Link brand (Air Nelson, 2011). From humble beginnings in 1976, the company has grown into an important contributor to the regional economies throughout New Zealand and now operates 23, 50 seater Bombardier Dash 8-Q300 aircraft. As well as the main hub in Nelson, the company operates crews from Auckland, Tauranga, New Plymouth, Napier, Wellington and Christchurch. 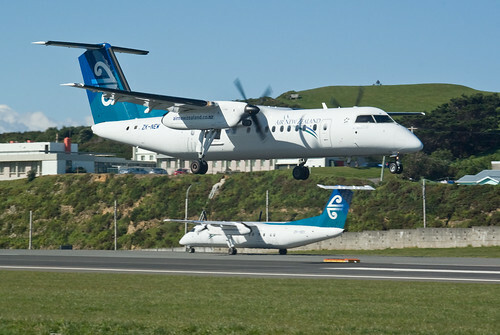 In addition to the 16 destinations already served, the company plans to operate services from Paraparaumu Airport on the Kapiti Coast from October 2011. Air Nelson began operations in 1976 as a small flying school operated by Robert Ingils and Nicki Smith. They began their first schedules services between Motueka and Wellington in 1984 using a Piper Aztec and over the following years, grew further as they added further destinations to their network. The then Motueka Air grew their fleet to include several Piper Navijos and Cheiftain and their destinations to include Wellington, Nelson and Palmerston North. In 1988, the name "Air Nelson" was adopted. The airline industry within New Zealand was undergoing significant changes at the time and deregulation had created a surplus of operators (Kerr, 2011). At this time, the value of a joint agreement between Air Nelson and Hamilton operator Eagle Air was recognised and the two signed an interline agreement to feed each others networks. Later, in October of 1988, Air New Zealand bought 50% of Air Nelson (and Eagle Air) in an effort to secure a regional feed into their domestic fleet. This led to further expansion of the fleet when the first Metroliners were purchased to supplement operations. In 1990, Air New Zealand withdrew its fleet of F27 Friendships from and Air Nelson grew further purchasing more Metroliners and a new fleet of Saab 340A aircraft to cover provincial routes. Air New Zealand took full ownership of Air Nelson in 1995 and by 1996 the Saab fleet had grown to 13. At this time, it became clear that it was necessary to draw all three domestic link operators together under one label and thus the Air New Zealand link livery was introduced to Air Nelson, Mount Cook Airlines and Eagle Air aircraft. Into 1997, Howard Jellie was introduced as the company's general manager with the intention of adopting Air New Zealand philosophies and practices. With the real cost of air travel decreasing during the late 90's and early 2000's it was recognised that the comapny required a new fleet of aircraft in order to continue delivering a quality product to its customer and in October 2004 it was annoucned that a $350 million deal had been struck with Bombardier Aerospace to provide 17 new Q300 aircraft (Air Nelson, 2011). On the 28th of July 2005, the first aircraft was delievered and over the following 2 years, the fleet grew further and as such the Saab fleet was slowly phased out of operation. The final two Dash 8's entered service in 2009 bringing the fleet total to 23. Air Nelson currently operates to 16 destinations throughout New Zealand. The most recent addition being a once daily service to Hokitika to supplement Eagle Air's current 19 seater Beech 1900D services. In October 2011, Auckland-Paraparaumu services are due to begin with possibility of Christchurch-Paraparaum services in the future. The comapny also operates occasional charter services to smaller ports including Westport and Timaru. Air Nelson currently operate a fleet of 23 Bombardier Dash 8-Q300 aircraft. 1. Air Nelson (2011).About Us - Air Nelson. http://www.airnelson.co.nz/, 2011. 2. Kerr, G. (2011).Air Nelson. Link Magazine, June 2011.